This Allied Expansion Helix allows owners of the Aquan Prime forces from the Battle For Proteus PrimeBoxed Set to immediately expand their forces. 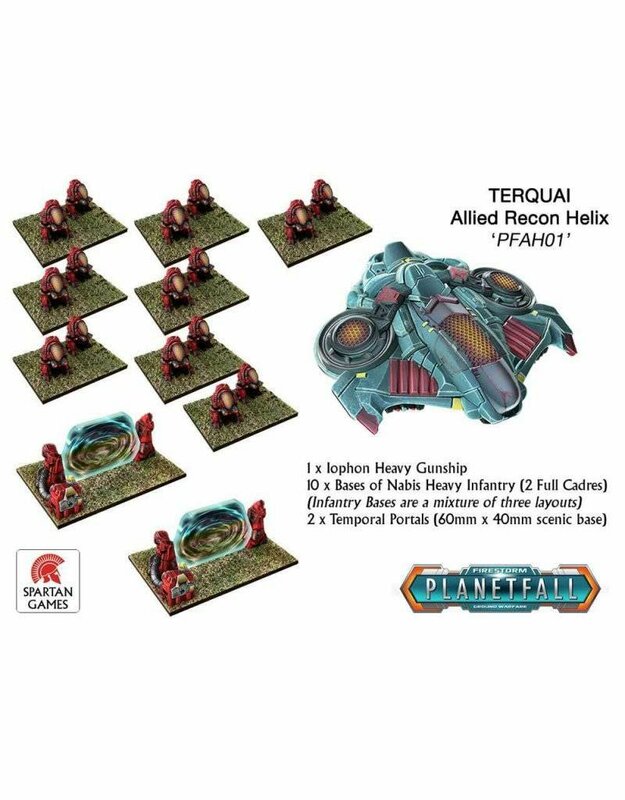 In the rules up to TWO Allied Helixes can be added to each Core Helix deployed into the heart of a ground battle. The Terquai are close allies of the Aquan Prime, and this Recon Helix is intended to aid Aquan forces in harassing their enemies. The Iophon Heavy Gunship lays down devastating fire, while itself soaking up enemy attacks, and can be used to deploy Temporal Portals onto a battlefield. The flexibility of this Helix though comes from the two cadres of Nabis Heavy Infantry Drones which can use the Temporal Portals to be transported instantaneously into battle zones. All models come unpainted and unassembled. Note: The Temporal Portals are provided with laser-etched live-edge acrylic to simulate the Portal in action.